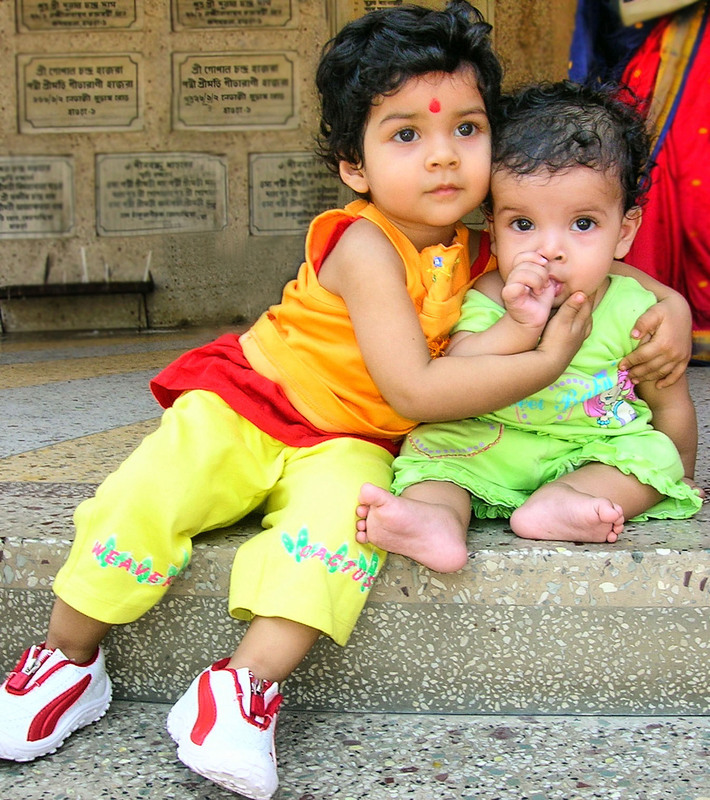 Khushi Baby is a wearable mHealth platform tracking maternal and child health to the last mile. Its mission is to reduce infant and maternal mortality due to vaccine-preventable disease. As explained in the Khushi Baby 2016 Annual Report, the Khushi Baby system comprises of a culturally tailored NFC necklace, which digitally stores immunization and health records for pregnant mothers and children. The necklace interfaces with a mobile app to update records, and serves as a social symbol of health that can be used to recruit more mothers to immunization camps and antenatal check-ups. The data is synced to a dashboard for health officials to manage care delivery resources. Also, the necklace serves as a social symbol of health that can be used to recruit more mothers to immunization camps and antenatal check-ups. The dashboard sends dialect-specific voice reminders to the family’s cell phone in the local dialect to encourage MCH awareness. The Khushi Baby concept originated in the Yale University class, “Appropriate Technology in the Developing World.” This class focuses on different global-scale problems. Students were assigned the task of developing vaccine-related innovations that could help prevent the 1.5 million deaths that result each year from vaccine-preventable diseases. While other teams focused on vaccine storage and delivery, Khushi Baby addressed the huge organizational difficulties faced by clinicians and parents as they document a child’s vaccination record. In many rural areas where public immunization rates are extremely low, methods for tracking vaccination history rely on outdated paper forms. Health workers are burdened by this inefficient system. Khushi Baby aims to streamline the data collection process. In the summer of 2016, I joined Khushi Baby as a Field Research Intern at their Headquarters, in Udaipur, Rajasthan. I am grateful to the Global Health Scholars program for enabling this work. While in Udaipur, I had the opportunity to gain hands on experience with designing and implementing a research study. With the help of Farhana Jamal and Pawan Singh, two members of the Khushi Baby team, we conducted a qualitative study focusing on rural community health workers’ experiences. I conducted the data analysis upon returning to Yale in HLTH 490: Global Health Research Colloquium with the guidance of Professor Elizabeth H. Bradley, PhD. What follows is an abbreviated version of the research paper produced in this class. The objective of the Indian Government’s National Rural Health Mission (NRHM) is to strengthen the healthcare delivery system in rural India, with a focus on the needs of vulnerable, village populations. In 2005, the NRHM established a new cadre of community health workers called Accredited Social Health Activists (ASHAs) (Bajpai, 2011). ASHAs act as village-level, grassroots workers who link the community to the public health care system by addressing both supply and demand-side issues. ASHAs have three roles: (1) to create awareness on health and its determinants; (2) to mobilize the community towards local health planning; and (3) to increase utilization of the existing health services (Fathima et al., 2015). ASHAs represent the cornerstone of NRHM’s strategy to address the millennium development goals on health related indicators in India (MoHFW, 2005). Rekha Rewat, an ASHA in Madhya Pradesh, India. Source: Nick Cunard, UK Department for International Development. Since its implementation in 2005, the ASHA program has been evaluated in numerous studies. The 2011 assessment from the National Health Systems Resource Centre emphasized that while the ASHA program is now operating at scale and serves an integral role in the public health system, the ASHA’s functionality and effectiveness can still be improved (Vedm et al., 2011). A further study found that the ASHA program increased immunization rates from 12-17%, but only in Indian states that give a focus to the program (Gopalan et al., 2012). Additional studies examined incentives, recruitment, roles and responsibilities, supervision, and training for ASHAs throughout India. The research emphasizes a need for stronger ASHA supervision and support, with clearly defined roles and responsibilities for all frontline health workers (Bajpai, 2011; Fathima, 2015; Singh, 2010; Rahman, 2010). Despite the usefulness of these findings, only one study of those reviewed report on the ASHA’s own views of their roles (Scott & Shanker, 2010). This specific study involved 25 interviews and 5 focus groups with ASHAs, health professionals and community members as well as over 100 hours of non-participant observation at public health centers. The research investigated contextual features of the ASHA program that are hindering the ASHAs’ capacity to improve health outcomes and act as cultural mediators and agents of social change. The study found the ASHAs’ payment remuneration system was inadequate, and that the hierarchical structure within the public health system “limited opportunities for meaningful communication across levels of status, seniority and income” (Scott & Shanker, 2010). The study concluded that progressive policy on community health worker programs must be backed up by more concrete institutional support designed to enable ASHAs to fulfill their roles. Therefore, despite numerous studies of the ASHA program, first-person accounts of the ASHAs’ experiences, including their views on the challenges they face in performing their various roles, remain largely unexplored. In particular, there is a lack of knowledge regarding the ASHA-patient relationship. With this in mind, the objective of the study is to understand how the ASHAs experience their work, including their perspectives on the challenges they must overcome to execute their duties. A specific focus of the study was to investigate the challenges the ASHAs face in the provision of immunizations and antenatal care for women and children. In the study, qualitative methods were used to capture the voice of the ASHA and to gain a holistic understanding of their role as the primary liaison between rural healthcare providers and the communities they serve. Given the central role ASHAs are intended to play in India’s health system, a deeper understanding of their experiences can help Indian policymakers gain a more comprehensive and valid view of the healthcare delivery system. To understand the ASHA’s experience, we conducted a qualitative study with a group of ASHAs working in Udaipur, a city in the western Indian state of Rajasthan. Udaipur is relatively under-researched compared with other regions in India. Qualitative methods are particularly useful for providing in-depth, nuanced understandings of individuals’ experiences and perspectives within local contexts (Ritchie, 2003). Using purposeful sampling to recruit ASHAs, researchers held interviews in situ in the rural villages throughout the region surrounding Udaipur to ensure the sample was reflective of diverse parts of the state. Data analysis was performed using factor analysis and constant comparative analysis. The data analysis generated a set of four key concepts, which represent the common view of the interviewed ASHAs that relate to the enablers that facilitate an ASHA’s ability to fulfill her role as a health care provider. The respective barriers to these enablers were also explored. We selected verbatim quotations to illustrate the recurrent concepts. The findings, reported below, are presented using the four factors as sub-headings. All of the ASHAs described home visits as central to their work and important for their impact on clients and families, particularly for ensuring mothers attended vaccination camps or received antenatal care. ASHAs house-to-house visits are effective for a variety of reasons: crucially, the ability to develop a personal relationship of trust with their patients, and the ability to involve the family. Two other ASHAs explained that this regular visitation meant they could reinforce the importance of attending vaccination camps or receiving antenatal care. ASHAs reported that they require adequate medical records about their patients in order to fulfill their roles as health care providers. The NRHM established the use of immunization (MAMTA) cards to record the immunization status of patients in rural areas, carried by the patients themselves. ASHAs explained that they need this documentation to give correct vaccinations. However, some mothers forget to bring their cards, or do not have one. In such instances, while some ASHAs keep personal records of their patients, others will not give treatment to the patient. Therefore, an enabler for ASHAs is to have adequate health records for their patients. They face a decision of whether or not they can give a vaccination without such records. If she forgets [the MAMTA card] than either we tell her to bring the card or as we also do entry in our registers, so we check it in our record and get her vaccinated accordingly. Even if they forget to bring the card, we vaccinate them as they have come from far places. Entry can be done later, but it’s important that they came to the camp. We found the ASHAs play a critical role as a link between the community and the public health care system. Understanding the factors that shape these workers’ experiences is essential for the improvement of the health care delivery. Previous research has focused on the need for strong institutional support for the ASHA program as a whole, prioritizing the need for a better payment scheme, and improving communication between ASHAs and higher tiers of the health care delivery system. Results from our qualitative study provide insights about the ASHAs’ own perspective on the challenges they must overcome to execute their duties as health care providers. Therefore, the presented research explores from a different perspective and in detail why institutional support is necessary for the ASHA program. The study offers a novel understanding of the experiences of the ASHAs, with particular consideration on the ASHA-patient relationship, and how this relationship might be strengthened. A predominant idea weaving through the four concepts discussed is the importance patients trusting the ASHA. ASHAs endorse house-to-house visits as a central component of their work because this was the “best way” to establish a bond with their patients and an understanding of their patients’ family situation. Additionally, ASHA’s required the trust of their patients to overcome the stigma surrounding healthcare practices, particularly in the issues patients have with antenatal care and vaccination. The main barrier to creating a relationship of trust was the inability to have face-to-face contact. This was a consequence of the ASHAs’ inability to visit the homes of her patients, either because she was required to sit at the vaccination camp for a certain number of hours or because transport was difficult. It was also a consequence of the patients themselves being unavailable, due to work or other family commitments. Facilitating ASHA’s ability to create a relationship of trust can markedly influence their impact. An ASHA’s household visit is a mechanism that results in a strong relationship between the ASHA and her patients. Given the importance of these visits, investigating the relative value of the required hours ASHAs must spend at vaccination camps should be a topic of future research. It is possible that with less time required at the camps, ASHAs might gain better access to patients in their homes. Additionally, with better access to patients’ homes, ASHAs might be more likely to enlist the assistance of patients’ families in healthcare decisions. This could strengthen the relationship with their patient, and lead to better health outcomes. Given that transportation was also cited as a barrier to household visits, this study has illuminated the need for either improved methods of transportation, or more health centers at accessible locations. From the perspective of the ASHA, inadequate transport limited their ability to fulfill their roles. Policy makers should prioritize infrastructure spending tailored toward ambulance availability in rural areas. ASHAs felt their role as teachers constituted an important factor in fostering trusting relationships with their patients. ASHAs acknowledged the “illiteracy” of their patients as an obstacle. Future research should analyze the most effective methods of education in these communities. Educational materials must be readily available for an ASHA to continue to de-stigmatize health care practices. It was found that ASHAs lack a uniform medical reporting procedure. Respondents reported that MAMTA cards are not always used. 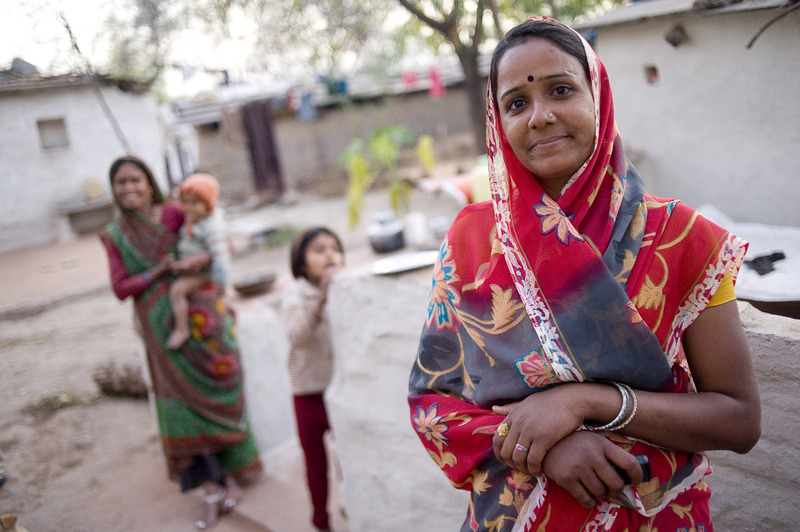 This hinders an ASHA’s ability to deliver appropriate health care services to her patients. A reliable system would ensure all patients who attend vaccination camps are accounted for and receive the appropriate medication. Future research should examine more effective methods of record keeping in rural areas. These findings should be understood in light of three main limitations. First, the sample size of 11 participants was determined by theoretical saturation — there may be additional ASHA experiences that were not mentioned by the interviewed participants. This points to the need for a more extensive study with more participants. Second, the interviews lasted approximately 30 minutes. To achieve a more nuanced understanding of the ASHAs experiences, the discussion guide might be revised to allow for more questions and a longer conversation. Third, the researchers’ presence during interviews (although unavoidable) may have affected the participants’ responses. Some ASHAs initially thought the research team consisted of members of the Indian government, with the purpose of evaluating their performance. It required some persuasion to convince the ASHAs that we were only there to have a discussion with them and hear their perspective. In a future study, focus group discussions could also be used to facilitate easier conversation. The four concepts identified by this study are key considerations for the development of the ASHA program. The study highlights the importance of adequate institutional support for the ASHAs and also reaffirms the significance of trusting relationships between the ASHAs and their patients. The added value of the study is that it is based upon the perspectives of the ASHAs themselves and what they perceive as bridges and barriers to fulfilling their roles as grassroots health advocates and community health workers. The ASHAs are remarkable women, and with the right support, have the potential to improve the health of the vulnerable village populations in rural India. Thank you to Farhana Jamal and Pawan Singh Bhadauriya for their consideration of the ASHA. Thanks also go to the ASHAs who gave their valuable time for interviews. The Yale Global Health Field Experience & Seed Funding Awards funded this research. Sara Locke is a senior in Branford College majoring in History of Science, Medicine & Public Health. Contact her at sara.locke@yale.edu. 2. Bajpai, N., Dholakia, R. H. (2011). Improving the performance of Ac- credited Social Health Activists in India. Columbia Global Centers, South Asia, Columbia University, New York (Working Paper No. 1). 3. Fathima, F. N., Raju, M., Varadharajan, K. S., Krishnamurthy, A., Ananthkumar, S. R., & Mony, P. K. (2015). Assessment of “Accredit- ed Social Health Activists”: A national community health volunteer scheme in Karnataka State, India. Journal of Health, Population, and Nutrition, 33(1): 137–145. 4. Indian Ministry of Health and Family Welfare (MoHFW). (2005). NRHM: Mission document. Government of India. Retrieved from: h p:// mohfw.nic.in/NRHM/Documents/NRHM%20Mission%20Document. pdf. 5. Vedm et al. (2011). ASHA–which way forward? 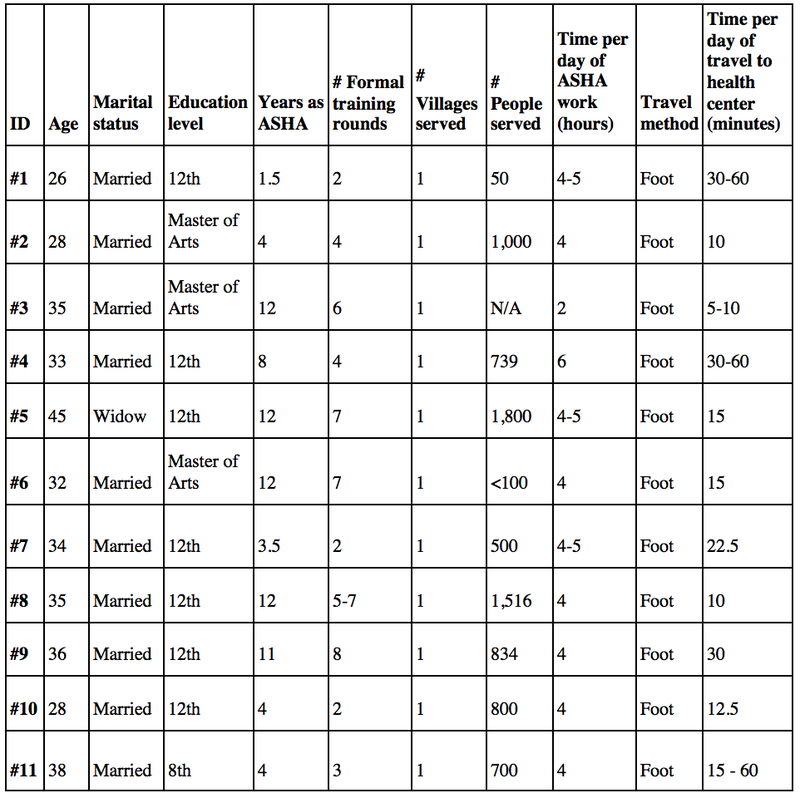 Evaluation of ASHA programme in eight states. New Delhi: National Health Systems Resource Centre (NHSRC). 7–10. 6. Gopalan, S. S., Mohanty, S., & Das, A. (2012). Assessing community health workers’ performance motivation: a mixed-methods approach on India’s Accredited Social Health Activists (ASHA) programme. BMJ, 2(5). 8. Rahman SM, Ali NA, Jennings L. (2010). Factors a ecting recruit- ment and retention of community health workers in a newborn care intervention in Bangladesh. Human Resources Health, 8:12. 9. Sco K, Shanker S. (2010). Tying their hands? Institutional obstacles to the success of the ASHA community health worker programme in rural north India. AIDS Care, 22(2): 1606–12. 10. Ritchie, J. (2003). The applications of qualitative methods to social research. In Qualitative research practice – a guide for social science students and researchers (ed. J. Ritchie and J. Lewis), 24-46. Sage Publications, London.